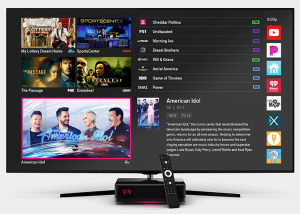 T-Mobile (NASDAQ TMUS) has released TVision in select markets across the country like Dallas, Los Angeles and Longmont Colorado, not far from the Headquarters of Layer3 TV. T-Mobile acquired Layer3TV in 2017. Two years later they have a product. The TVision looks like any other add on box, Apple TV, Roku or even Android TV. So what’s the big deal and why do we need another box? T-Mobile says that TVision will offer 150 channels. This includes all the big names like ESPN, Disney, Fox News and USA along with local channels. You will get all of this for just $90 a month. TVision – Easy to Hook Up. The box that you need to use TVision is pretty easy to use if you have a house with a wired network. You just plug in the ethernet cable and off you go. Additional boxes, just like the cable company run $10 a month, and you just plug in an ethernet cable to those also. If you aren’t sure what an ethernet cable is, it is those fat telephone cables computers use. You can put them at Amazon for $6. With my Cable bill hovering at $240 per month, the $90 deal from TVision is looking really good. Even if I didn’t subscribe to T-Mobile Cellular service and it goes to $99.99 per month after the introductory period it looks good. So what’s the catch? The catch is that you still need to pay your cable company or phone company for internet service. That can be anywhere from $40 to $200 a month. If you have four Visions boxes and your kids all watch different things, plan on getting the super hi speed $200 a month internet plan. With TVision you are now sharing your Gigs with the tv, and hi def TV is a gig hog. Finally you need a home with ethernet wiring built in. That isn’t everywhere and isn’t cheap. If you do have it and aren’t using it you will probably need another switch too. You also might still need a phone line, and that adds more to the cost. Suddenly my $240 cable bill looks pretty easy. How do you get the best deal on Streaming TV? The best trick I know is to make on connection point on the side of your house. This is called the point of demarcation or demarc. Make sure they don’t touch any wires inside your house and just switch every two years to get the best promo deals. Frontier, ATT and Spectrum all have not figured out the best customer is the one you have. They should get the good deals, instead they encourage you to “churn” by offering WAY lower deals to new subscribers. The hazard with churning if you don’t watch them closely is the techs will cut unused wires in your house to make it harder for you to churn. Many of the installers are unlicensed independent contractors who are paid a pittance each month you stay on board. So why is TVision better than Apple TV, Roku or the Android box? I don’t know, if you have one and figure it out, please let us know. And if you save money please include all the bills in your math with tax. For now it is time to go outside and play at the beach.